It's both Presidents Day and Black History Month, so it seems appropriate to run a picture of Barack Obama as the first Black president is rather historic, ya know. 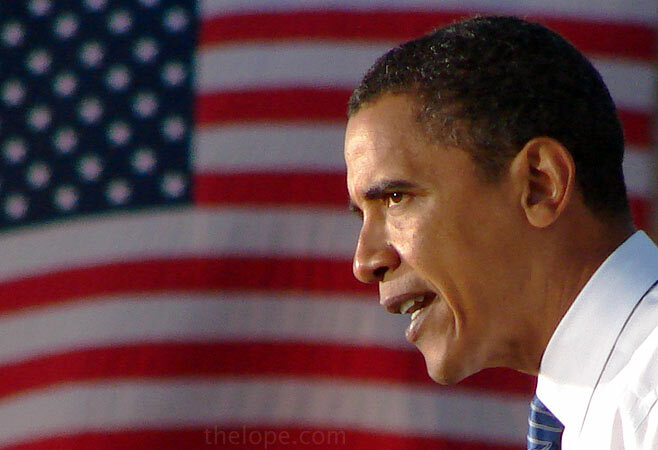 Thelope.com was invited into the press area at his 2008 campaign rally. That's right, a website mostly devoted to the adventures of a jackalope was invited to cover part of the presidential race. Granted, "Presidents Day", also properly called "Presidents' Day", is actually a morphed version of George Washington's Birthday and has also come to encompass Lincoln's. In Alabama, President Jefferson gets a piece of the action and in Arkansas today is also Daisy Gatson Bates Day, celebrating the civil rights activist. However, Washington, Lincoln and Jefferson all inconveniently died before I could take pictures of them, so I offer two more living presidents. 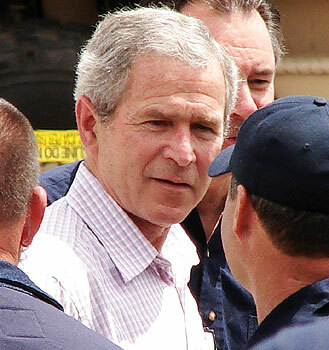 George Bush visited tornado-ravaged Greensburg, Kansas, while we were shooting stories about the effects of the storm. It was actually kind of an inconvenience as this was a professional gig and I was being paid to photograph residents who became hard to get to because of Secret Service road blocks set up to protect the President. I wasn't even supposed to be allowed on the grounds of the courthouse where Bush was appearing, as this was for residents, but I managed to walk right by a Highway Patrol officer who was busy talking to someone else. Then, Congressman (now Senator) Jerry Moran helped me figure out exactly where on the grounds Bush would be seen. This made for one happy editor. We saw Bill Clinton in 2007 at the Landon Lecture series at Kansas State University in Manhattan, Kansas, and later at the Washington Days celebration in Topeka.